Lighting around camp has always been an important part of every camping trip, and its not something you should overlook. If you don’t have adequate lighting, you may find yourself stumbling around the campsite shortly after dusk. Don’t rely on your campfire or the moon to illuminate the way to the toilet, or to find your gear in your tent. We have tried all sorts of lights and we know what works for us and our camping set up, but are always keen to see what else is on the market. First thing we notice before turning on the light, is that it’s small and sturdy. Not flimsy at all and has a carabiner attached, perfect for hanging from your tent or backpack. Made of hard plastic, it seems a lot tougher than lights of similar size and when camping, you do want equipment that can take some knocks and tumbles. You don’t want to be precious with all your gear. Another small feature, but one I love, is the fact that it has a magnet attached to the bottom, so this makes this the sort of lantern that I will keep in my house when not camping (as I type this, its actually stuck to the side of the fridge in case of power outage). That might be a minor feature, but it’s the little things, which can make a big difference. But apart from looking smart, how are the lights? At 165 Lumens (the higher the lumens the higher the brightness from the light source will appear) this is a good bright light for your camping. We recently reviewed another outdoor lantern – Luci Solar Powered Lantern, which gives off around 50 lumens, so you can see there is quite a difference in the level of brightness between the two. You do have different output options for lighting, which will help conserve your batteries if you choose to use a lower setting. The white lights – ranging from Turbo to Low are all activated via the one button at the front. Very simple to operate. Just press the button until you get the lighting you need. I would use this light when I need a good strong light in a tent, or when needing extra light when cooking or just placing on the campsite table to help provide additional illumination - because extra light is always beneficial. As you scroll through the white lights, you come to red lights which have 2 options – regular steady red light, and a flashing red light. The red lights (1.5 lumens) are considerably less bright than the lowest white light (8 lumens). What is the purpose of having a red light you might ask? Red lights use less battery and therefore you can extend the life of your lantern light, which depending on where you are, could be an important factor. And if you like to utilize your night vision but don’t want to be completely useless whilst your eyes adjust to the darkness, a red light can help you out. Or, use the flashing light in an emergency. There are benefits to having the red light available to you, whether it be on a lantern or headlamp. I personally don't use a red light very much, and haven't had a great need of it in the past, but its a feature that is seen on many headlamps, and it does have benefits as listed previously. Using lanterns with batteries can be a bit annoying. I do try to avoid lighting around camp with batteries in case of not having the batteries charged sufficiently, but more often than not – you don’t have many choices to avoid battery items – so I have to deal with it! 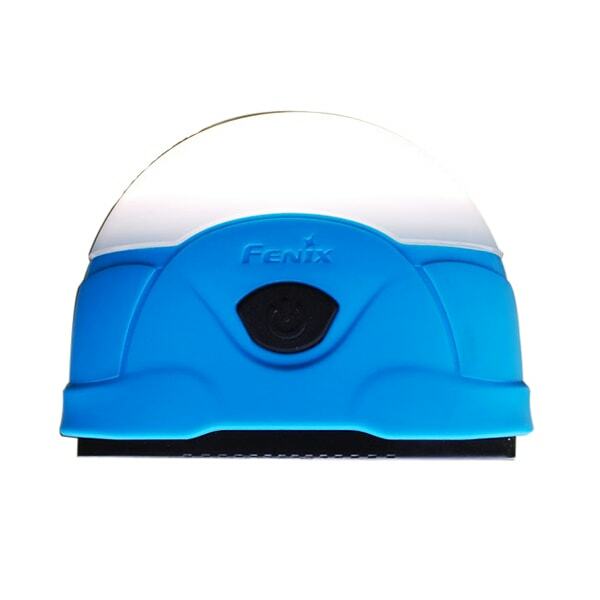 With the Fenix, you have the choice of using AA batteries (we choose good quality rechargeables) or CR123A batteries (non rechargeable). The method to get in the batteries is very simple too, and doesn’t require those tiny little screwdrivers ! Just twist the carabiner, and the bottom lifts off with a slight tug. How long will the batteries last? Scroll back up to the top of this story for the times provided by the manufacturer. This is a handy little lantern to have around the campsite or at home. Like the Luci, both have great, unique features, but they are 2 different lanterns and would be used differently at a campsite. This lantern is the more rugged of the two, with the brighter light and remaining a very compact light to have in your pack or camping supply box. It is the sort of lantern you would use when you want a compact light, and not concerned about it getting wet because it does tolerate rain and extreme cold. The lantern is sold with 2 AA batteries, but we would recommend placing some good quality batteries (or rechargeable AA batteries) in the lantern before any camping trip. Update: After 2 weeks of testing this light (turning on/off, jostling it around a little, and changing batteries), the light will now no longer work. It might be that we just got unlucky with our lantern - these things happen - but it's a little disappointing that we haven't been able to benefit from it longer. This lantern was replaced by G8 readily with no questions asked, so we do thank them for their prompt attention. Good camping and outdoor product retailers should stock them. This lantern was gifted to Go Camping Australia for the purpose of the review. To find out more about how we review products , giving our honest opinions, please read more at our review page.